A measurement does not mean much if it is not accurate or precise. And there is a difference! Accuracy: how close a series of measurements is to the true or accepted value, meaning is the value correct? 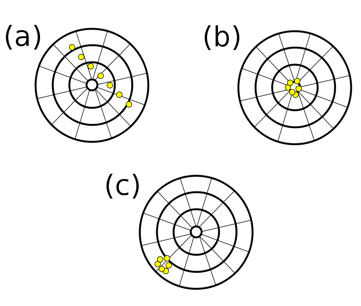 Precision: how close a series of measurements are to one another, meaning are all the values consistent or all over the map? (b) accurate + precise: consistently hits the bullseye! Remember, there is no confidence in a measurement if it is not close to the actual value (inaccurate) nor is there any if the measurements are not consistent (lacking precision). How do we achieve accuracy? Correctly take the measurement—pay attention and watch your calculations! How do we achieve precision? Select the proper measuring instrument—the more increments, the better. 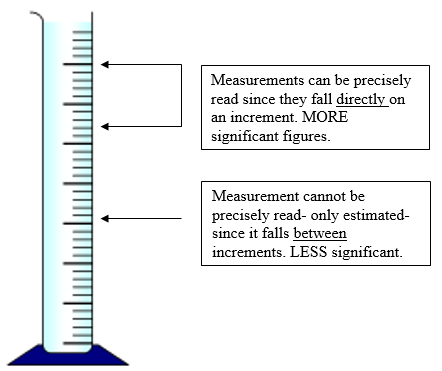 Estimates are not precise so the more precise your measurement, then the more significant figures it will have.